BROWN OR GREEN PATINA OR CHOOSE BRASS INSTEAD OF COPPER ! Every copper tile we make is handcrafted from raw copper thickness 0.57mm ( .020") the same as for roof use. Its very strong and durable. Do they install like regular tile? Yes they do. Thinset mortar is used, just as normal tile. Grouting is needed: make sure you wipe off all excess of grout and do not allow grout to dry. Can I order tiles with my own design ? Yes. Familly names, company logos and coat of arms are perfect to be used as an wall decor idea. Simply email us with the picture or links. We will contact you with the details as price and time neccesary to make your custom order. We will draw visualisation of how it would look like. How to maintain and clean the tiles? We use and advice Renaissance Wax to protect our patinated tiles. Copper will slowly and beautifully age over time. Soft cloth, mild soap and lukewarm water is best for cleaning. We do not laquier our products. What patina option do you offer? We basicly offer two choices of copper patna finish : brown and green. These are two colors that we find most attractive on our copper tiles. We can customize patina for your wish. 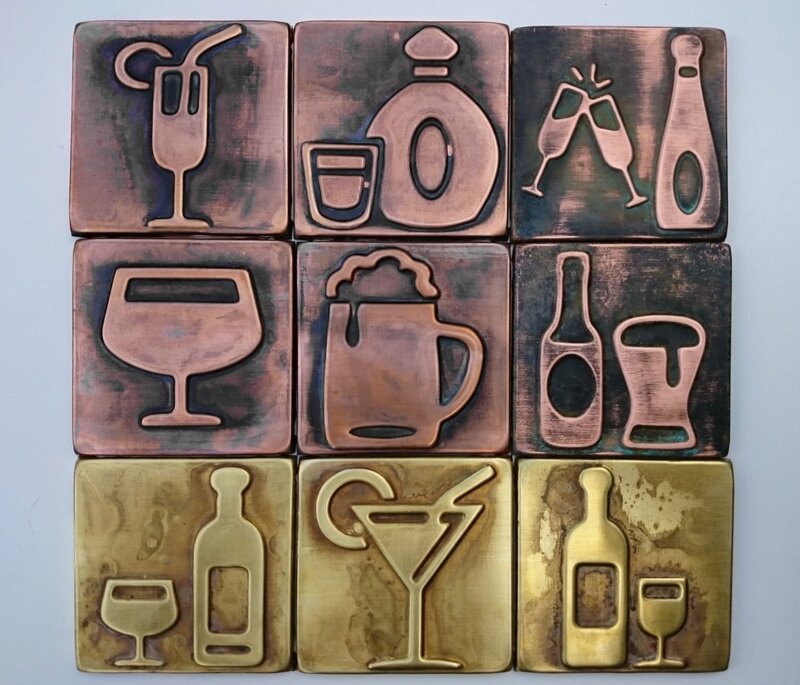 Each batch of our handcrafted copper tiles may differ slightly in tones and shades from the next as they are all individually polished by hand, which adds beauty to each of our unique metal piece of art and craft. Please check our listings and photos for patina effects that we can make for you. Can I order tile with my own design, company logo etc. ? Yes you can. Simply email us with the picture of your choice (jpg or vector file). You will receive an e-mail when your quote is ready. Are these tiles "green" ? We are committed to making a beautiful long lasting product by the most environmentally friendly process possible. Metals are among the most recycled materials there are. They have a high values and they are easy to reclaim and reuse. Our tiles have a high recycled material content and 100% of our scrap is reused or recycled. One of the most overlooked aspects of green consumerism is longevity. In the long run the greenest product is often the one which lasts the longest. Copper lasts practically forever. Can they be used outdoors? Yes, for wall applications, outdoor kitchens and wineyards. Can they be used on floors? We do not recommend floor use.